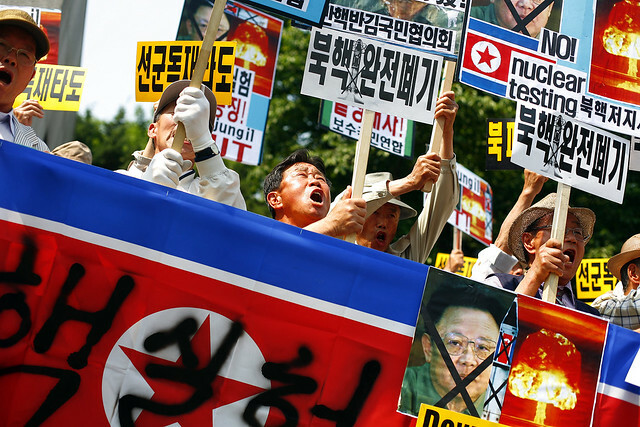 Home » ASIA PACIFIC » A Peninsula Back at War: what’s happening between North and South Korea? A Peninsula Back at War: what’s happening between North and South Korea? Much has happened between North and South Korea since the peninsula was divided into two in 1945 following World War II. The Western world appears to have grown accustomed to ridiculing North’s boisterous talks and noisy threats to attack the South and defeat the Western capitalist imperialists. With the recent changes to the status quo however, perhaps it is time to re-evaluate North Korea’s threats. There were two major events in recent history that sparked the increase in tension between the two countries. The first was the sinking of South Korea’s navy battleship, Cheon-An-Ham, on March 26th 2010. A total of 40 navy men died and 6 went missing from this attack. When the battleship first floundered, South Korean government hesitated to accuse North Korea for the attack due to North Korea’s denial. South Korean government created a special committee to uncover the truth behind the sinking, and its members included some 24 specialists from South Korea, Australia, U.S.A, Sweden, United Kingdom, and other nations. On May 20th, this committee declared that the sinking was caused by a torpedo fired from a North Korean submarine. With this declaration, the issue was brought to the international platform and discussions on sanctions for North Korea commenced. However, North Korea continued to deny accusations and all talks on sanctions were tabled due to Chinese and Russian protests. The second major event was North Korea’s shelling of Yeon-Pyeong Island of West Sea that took place November 23rd 2010. Yeon-Pyeong Island lies only 3 . 4km away from the North Korean border. North Korea fired over 100 shells which resulted in 2 deaths and 16 injuries among South Korean navy officers and 2 deaths and 10 injuries among civilians. This was the first time that North Korea initiated a non-discriminatory attack on civilians since the ceasefire treaty was signed in 1953. Later between November 28th and December 1st, South Korea and the United States joined forces for the largest joint military training in South Korean history. This military cooperation sparked greater tension as North condemned its neighbour for working with the “capitalist imperialists” and threatened with future attacks if the training continued. Since the two attacks in 2010, the peninsula has been walking on thin ice. There was a leadership change in both countries – Kim Jung Un took power following the death of Kim Jung Il, and more recently, Park Geun-Hye (South Korea’s first female president) was voted into office. These changes in leadership are far more significant than most people think. Something that is not as well known in many Western countries is that Kim Jung Un is an even more radical character than his father (Kim Jung Il) and his grandfather (Kim Il Sung). It’s undeniable that North Korea became more belligerent following its designation of Kim Jung Un as Kim Jung Il’s successor. There could be two main causes behind this increase in aggression. First is because Kim Jung Un has to prove himself to the massive military leadership that North Korean government is tied to. He has to convince the military leaders that he has the guts to attack South Korea and has to prove that the military program will still grow under his own leadership in order to secure his position within the government. Second is for the population. When Kim Il Sung first established the communist government, the people had reasons to follow him. Coming out of the Soviet occupation, Kim Il Sung symbolized self-determination, autonomy, and freedom to the North Korean people. Thanks to this, much of Kim Jung Il’s political career was based on what Kim Il Sung had already achieved. 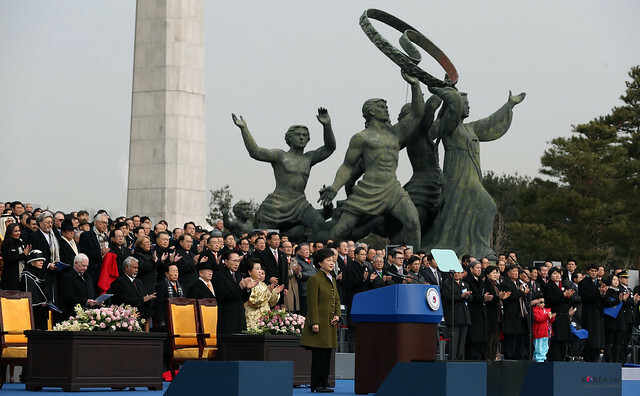 Despite the deteriorating living conditions of the people, those that were not concerned about daily survival were still devoted enough to Kim Il Sung to pay loyalty to his son. However, Kim Jung Un faces a different scenario. Living conditions have worsened significantly during his father’s rule, and his grandfather’s legacy of glory appears too distant for him to use as the foundation for his political platform. So he is responsible for convincing the people that he can stand up against external threats. And who would have been the most ideal target to prove his position? Of course, it’s its democratic Southern neighbour that cooperates with those devilish Western forces. Ultimately, the recent increase in aggression is a process of Kim Jung Un trying to prove himself to his own government and people. As for Park Geun-Hye, South Korea’s first female president, her government has an attitude of its own. Compared to the previous South Korean leaders, Park has less tolerance for North Korean belligerence. She is the daughter of the former president Park Chung-Hee, who is often labelled a dictator among Western countries for taking control of South Korean government with a military coup in the 1960s. She has a unique background because she first entered politics at the age of 22 as the replacement First Lady when her mother was assassinated in 1974. As the replacement, she carried out all the tasks a First Lady would be expected to complete – greeting foreign ambassadors, engaging in talks with foreign leaders, etc. This task ended when her father was also assassinated in 1979. One thing to note about her is that she is not someone to mess with. Even in her political campaign, she made it clear that she will not tolerate any further aggression from North Korea. This position is obviously not welcomed by the North Korean government, and this fluctuating dynamic between the two countries is central to the increase in tension. Enough with the downplaying – time to think seriously as well. Many Western media is accustomed to downplaying whatever statements North Korea makes. Of course, threats of military attacks from a country as impoverished and lopsided as North Korea may seem like a joke. But is that all this is – a boisterous tantrum and a parade of hollow threats? Regardless of what the North intends to do (or not do according to many skeptical Western sources), it’s time to seriously look at the situation and stop downplaying everything. 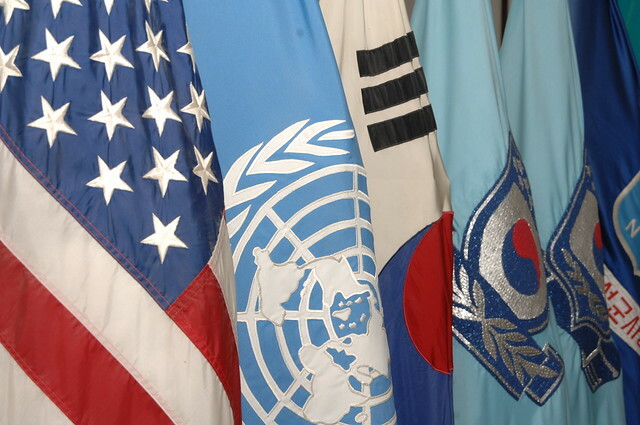 In response to the ongoing American-South Korean joint military training, North Korea cut its hotline with the United Nations Peace Keeping forces on March 5th. As of March 11th, North Korea declared a nullification of the ceasefire treaty between the North and South. It also cut its hotline with South Korea’s side of Panmunjeom Office at the 38th Parallel (Panmunjeom: office located on the border at 38th parallel, primarily responsible for frontline communication with North Korea). A few days ago on March 29th, North Korea declared a state of war against the South. With its recent success with its nuclear weapons, North Korea is threatening to fire nuclear missiles against not only the South, but also the United States. Many people laugh it off and say, “they’ll never do that – that’s mutually assured destruction”. That’s what most rational people would think. But something else to keep in mind is that the North Korean government doesn’t always act the way a rational government would. This is apparent in the most recent breaking news from earlier this morning when North Korea declared that it is reactivating its only nuclear plant to increase plutonium production for its nuclear weapons. While experts say that it will take a few years before the plant will become fully functional, North Korea’s message is clear: it’s not willing to negotiate its nuclear programs and it’s not looking for friendly communication. U.N Secretary-General Ban Ki-moon also commented on this news, stating that North Korea is “on a collision course with the international community” and that “nuclear threats are not a game”. Lee Ho-ryung, a specialist on North Korean nuclear program further stated that North Korea will have enough plutonium to make two atomic bombs in only four years. The news troubled not only South Korea, but China, Japan, and the United States’ government. It’s difficult to determine which parts of its threats are worth being concerned about, but it is even harder to foretell what North Korea intends to do. Yes, take whatever they say with a grain of salt. But it’s time that Western media put aside ridiculing the North’s less-than-attractive leader and focused on the fact that North and South officially no longer have a ceasefire. We have a peninsula back at war. Tiffany (Chae Yeon) Lee is studying Political Science and International Relations at McGill University. She was born in South Korea and immigrated to Canada in 2004. Her interests include current issues (specifically in East Asia), environmentalism, human rights, and learning foreign languages and cultures. well, this will do good for my school report.